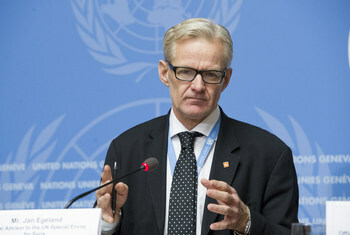 Jan Egeland is Secretary General of the Norwegian Refugee Council. He co-organized the secret talks between Israel and Palestine that led to the historic 1993 Oslo Accords. OSLO, Norway, Sep 14 2018 (IPS) - Twenty-five years ago, on 13 September 1993, I sat on the White House lawn to witness the landmark signing of the Oslo agreement between Israel and the Palestine Liberation Organization (PLO). Diplomats around me gasped as Prime Minister Yitzhak Rabin shook hands with former foe, Chairman Yasser Arafat. But for some of us present, the handshake came as no surprise. Weeks earlier we watched the midnight initialing of the same accord in Oslo. It had been the culmination of an intense eight months of secret talks in Norway, a private back-channel we initiated to end hostilities. Previous peace diplomacy efforts had failed. A triad of occupation, violence and terror had reigned for many years. The Oslo Accords led to a rare epoch of optimism in Israeli-Palestinian relations. Our optimism may seem naïve today. Hindsight can raise many worthwhile critiques about what that handshake missed. Importantly, the Oslo “Declaration of Principles” was no peace agreement, but rather a five-year time plan for how to negotiate peace through increased reconciliation and cooperation. Peace antagonists took little time to tear down our efforts to facilitate agreements on Jerusalem, settlements, refugees, and the status and borders of a future Palestine. Israeli terrorists killed Prime Minister Rabin and Muslims at prayer in Hebron, while a terror campaign from Hamas and other armed groups targeted buses and marketplaces in multiple Israeli cities. Before final status issues could be fleshed out, the tide of optimism gave way to more terror, violence and brutal crackdowns. The following years brought a second intifada, record expansion of illegal settlements, an increasingly entrenched military occupation, division among Palestinian factions, and the closure of Gaza. Instead of recognition and a commitment to sit at the same table, the political context devolved into extreme polarization and mutual provocation. Twenty-five years later, it is time to learn from the past. Too few concrete steps were made during the initial months when mutual trust existed. Political elites on both sides did too little to enable reconciliation, justice and security in their own backyards. We also made mistakes as international facilitators in underestimating the counterforces against peace. As in so many places where peace diplomacy fails, humanitarians had to step in to provide a lifeline. In the absence of a long-term solution, urgent needs only increased. Today, I lead a large international aid organization assisting millions of people displaced across the world, including Palestinians in Gaza, the West Bank, Lebanon and Syria. I have rarely seen, felt or heard as much despair as among Palestinian youth locked into hopelessness in camps and behind closed borders. Unemployment for Gaza’s youth sits at 58 percent, according to the World Bank. In a time when peace efforts are at a standstill, it has been more difficult than ever to deliver humanitarian assistance to Palestinians. Relief funding is diminishing, while humanitarian needs are on the rise. Partisan lobby groups and politicians hostilely question aid agencies focused on protecting human rights, more than any time in recent years. As Palestinians increasingly struggle to meet basic needs, economic opportunity is stifled by endless occupation. This is bad news for Israelis and Palestinians. It is not in Israel’s interests to oppress future generations of Palestinians, contributing to increasing bitterness in its own neighborhood. Despite the grim trends, there is still a way out of the vicious cycle of conflict. Perhaps precisely therefore, in this bleak hour, we may have the foundation for a genuine peace effort. It can only be a matter of time before Israeli leadership realizes its long-term security is squarely dependent on equal rights and dignity for millions of disillusioned Palestinian youth. Bridging humanitarian funding gaps and allowing aid delivery would raise real GDP in the Gaza Strip by some 40 percent by 2025, according to the World Bank. Such short-term gains can be bolstered by long-term investments in employment and increasing connectivity between the West Bank and Gaza. Financial aid and other forms of investment in the Palestinian economy are urgently needed, but they are stop-gap measures, not the solution itself. Without a final political agreement, there can be no end to the human suffering. Only a “just, lasting and comprehensive peace settlement” will lead to “peaceful coexistence and mutual dignity and security.” These principles remain as true now as they were 25 years ago. But they must be rooted in reverence for international law. Palestinians are as entitled to basic human rights as are Israelis or Americans. Any future positive gains are only sustainable when fortified by a commitment to a political solution that upholds the rights and security of all people in the region. No external actor has more potential for resolving the Israeli-Palestinian conflict than the United States. Only Americans have real leverage on the parties and the ability to provide the security guarantees needed. A new U.S.-effort is sorely needed as tensions build once again, humanitarian work becomes more difficult, and tens of thousands of youth take stock of their lack of options. However, unless America’s “ultimate deal” delivers equal rights, justice and security, grounded in respect for international law, it will only serve to strengthen political extremism among Israelis and Palestinians, further destabilize a volatile region, and ensure that too many Palestinians will continue to live under seemingly endless military occupation. The two-state solution, like the Holy Roman Empire, did not solve anything (except the shortage of graves in Israel and terrorists in the Middle East), and did not create two states. Not unless you count the “bad” Islamic terror state in Gaza and the “good” Islamic terror state in the West Bank (Judea and Samaria). Rather, the two-state solution is a perverse euphemism for carving an Islamic terror state out of the land of Israel and the living flesh of her people. more people than the average natural disaster–the two-state solution is a textbook example of cognitive dissonance on a grand political scale on multiple fronts. The most obvious being that supporters of the two-state solution often warn of the “demographic threat” posed by Israel’s continued hold on Judea and Samaria, with Israel having to choose between being democratic or Jewish if it remains entangled amidst millions of Palestinians. Their solution is to create a 23rd Arab nation and allow millions of descendants of Palestinian refugees to flood into Judea and Samaria thereby destroying the Jewish majority that the state of Israel has achieved between the sea and the Jordan river. Brilliant! The two-state solution never existed. There will be only one state in Israel. The question is whether it will be a Jewish State or an Islamic terror state.